Welcome to AutoMotion Photography! This blog is dedicated to the love of automobiles and photography. Here are a collection of photos of exotic automobiles such as Ferrari, Lamborghini, and Aston Martin all on the streets of South Florida. Some are from events and photo shoots are included. 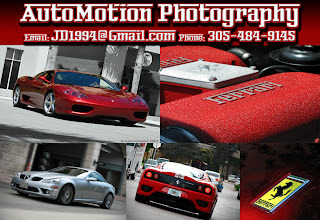 I am open for photo shoots or event coverage anytime with any type of cars Miami, if you need any information or have any question please contact me at JD1994@gmail.com. Enjoy the photographs! Labels: Ferrari, Photography, Nikon, Car What is AutoMotion?